Telluride is in San Miguel county. The only insurance carrier selling plans in San Miguel county is Anthem BCBS. I’m curious how this compares to the total providers in that county. You know the market better- do ESI plans have better networks? The above question on twitter asked how these networks would compare with Employer Sponsored Insurance plans. So as a random benchmark, the United Healthcare small group network is compared here too. United does not sell plans in the individual market at all. Anthem BCBS has 1 unique providers in San Miguel County. Anthem BCBS has 0 unique facilities in San Miguel County. Anthem BCBS has 1 total unique providers + facilities in San Miguel County. Bright has 0 unique providers in San Miguel County. Bright has 1 unique facilities in San Miguel County. Bright has 1 total unique providers + facilities in San Miguel County. Cigna has 0 unique providers in San Miguel County. Cigna has 3 unique facilities in San Miguel County. Cigna has 3 total unique providers + facilities in San Miguel County. Colorado Choice has 0 unique providers in San Miguel County. Colorado Choice has 0 unique facilities in San Miguel County. Colorado Choice has 0 total unique providers + facilities in San Miguel County. Denver Health has 0 unique providers in San Miguel County. Denver Health has 0 unique facilities in San Miguel County. 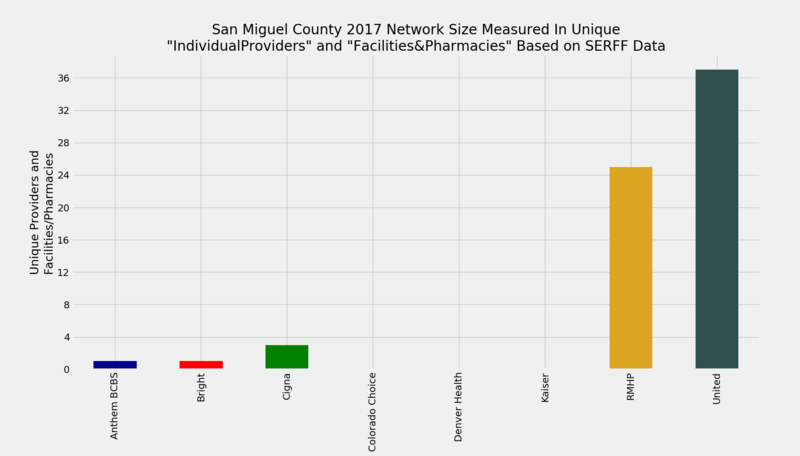 Denver Health has 0 total unique providers + facilities in San Miguel County. Kaiser has 0 unique providers in San Miguel County. Kaiser has 0 unique facilities in San Miguel County. Kaiser has 0 total unique providers + facilities in San Miguel County. RMHP has 18 unique providers in San Miguel County. RMHP has 7 unique facilities in San Miguel County. RMHP has 25 total unique providers + facilities in San Miguel County. United has 33 unique providers in San Miguel County. United has 4 unique facilities in San Miguel County. United has 37 total unique providers + facilities in San Miguel County.